When you hear about a Bugatti today, it’s likely a Veyron or a Chiron, hypercars produced by VW using the historic racing car name. However, there’s an often forgotten Bugatti lurking in the family tree, the EB110 GT. 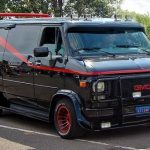 Just 136 were completed from 1991-1995 and for a time, it was the fastest production car in the world, a record its descendants have also held. The EB110 GT was the first car to resurrect the famed Bugatti nameplate after a decades-long dormancy. In fact, the EB110 GT is a tribute to Ettore Bugatti, founder of the company that bore his name, released on the exact date of his 110th birthday. Bugatti, who considered himself as an artist as well as an engineer, founded Automobiles Ettore Bugatti in 1909 in the city of Molsheim, then part of Germany. While only about 8,000 cars carry the Bugatti name, they’re world renowned for their blend of artistry in design and mechanics. The engine of a Type 35 Grand Prix car is like a fine watch, exquisitely crafted and practically indestructible. 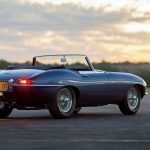 The Type 57 “Atlantic” and Type 55 sports car are highly valued to this day. The gargantuan Type 41 Royale remains one of the largest, most luxurious and mysterious cars ever built. The six or so surviving examples are squirreled away in private collections and museums. Bugatti also built railway engines based on the Royale’s motor. Ettore Bugatti passed away in 1947, and the company folded within a few years, as his son, Jean, had died a few years before. While there were several attempts to revive the name, none took hold until Italian entrepreneur Roman Artiolo opened a new factory. Despite being out of production for decades, the Bugatti name embodies European luxury and performance. The prestige of the name alone ensures buyers will pay a premium price for any new Bugatti car. However, it was no feeble marketing exercise. The Lamborghini Miura is widely considered to be the first “supercar.” The launch of the EB110 GT was one of the first cars known as a hypercar, a supercar turned up to 11. Most classic Bugattis were racecars or racecars redesigned for the road. The EB110 was planned to be a fast GT car to rival the Ferrari F40, Lamborghini Diablo and the Porsche 959. When it debuted, the EB110 GT featured a 3.5-liter V-12 fitted with four turbochargers, driving it to a top speed of 213 mph, a performance that would put it in the top ranks among today’s hypercars. 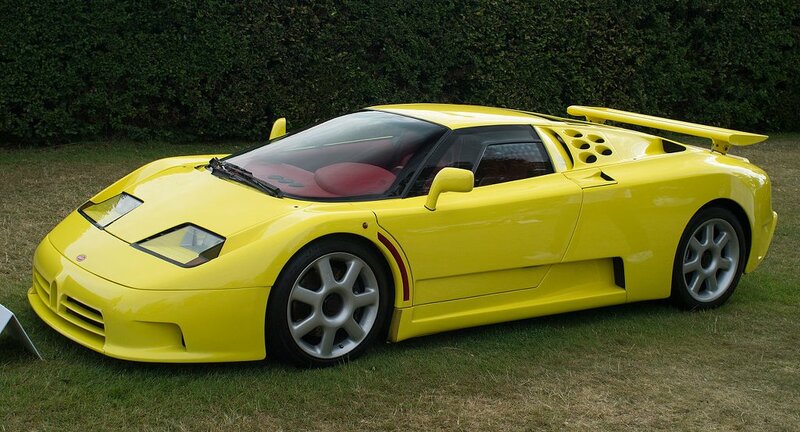 For 1991, the EB110 GT was an engineering marvel with a full carbon chassis built by aircraft company Aérospatiale. A sophisticated, all-wheel-drive system and manual gearbox managed all that power. Like other exclusive members of its class, the styling was sculpted by Italian designers Giampaolo Benedini and Marcello Gandini and features the signature scissor doors, which were still a new thing then. Every beauty queen has a flaw that makes her beauty unique. For the EB110 GT, the weakness is the diminutive nod to the historic horseshoe-shaped Bugatti grille. On original Bugattis of the ’20s and ’30s, the grille surrounded the radiator – you could tell it was a Bugatti from a hundred yards away. On the EB110, the horseshoe grill was a few inches long, part of the more substantial front grille molding that downplayed the car’s heritage. 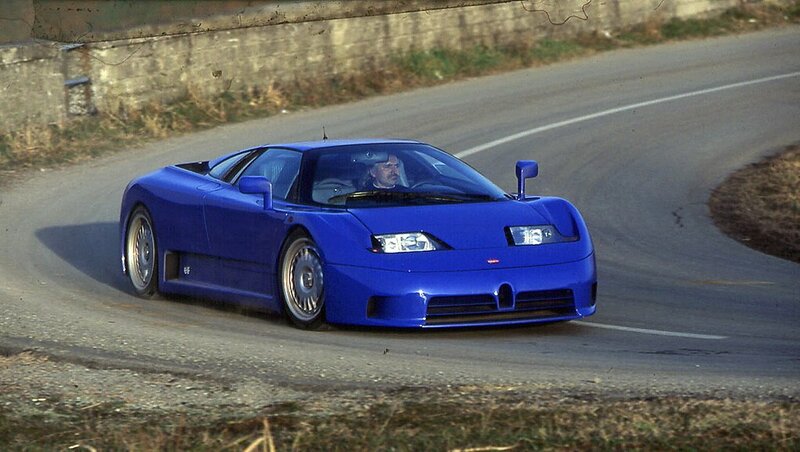 The EB110 holds another place in Bugatti family history – it’s the first one to be made with left-hand steering. 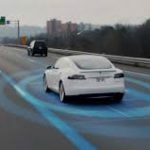 All previous models were built with right-hand steering because they were racecars, which run predominately clockwise and favor a driver on the right side of the car. There’s an even more exclusive version, the EB110 SS or Supersport. The SS featured 612 horsepower for a 0-60 time of 3.2 seconds a top speed of 216 mph. An adjustable rear wing and a lighter body contributed to those performance stats. Only 31 were built, including four for the Sultan of Brunei. These rarities occasionally show up at auction, with only a few more miles on the odometer than the last time they were advertised. The company ceased production before the confirmed orders for models that met U.S. regulations could be fulfilled. Volkswagen acquired the rights to use the Bugatti name and logo in 1998 and began developing the Veyron 16.4. After about seven years of development, it debuted in 2005. You’ll find EB110 GTs at auction for under $1-million, while the Veyron and Chiron are usually a multi-million dollar purchase. For most people, opportunities to see an EB110 in the flesh are rare. One might surface at a high-end auto auction or collector car show. Perhaps its greatest claim to fame now is its presence as a playable car in the Forza video games. Beset by its manufacturer’s financial troubles, the EB110 GT buzz faded quickly, but smart collectors are rediscovering its value. 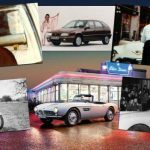 It has become recognized by the Bugatti Club of America and offers a relatively inexpensive entree into the exclusive world of Bugatti ownership.